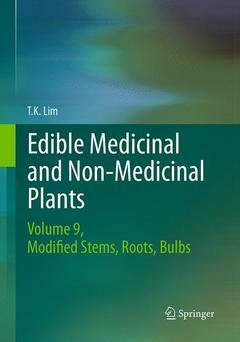 Edible Medicinal And Non Medicinal Plants Lim T. K.
Auteur : Lim T. K.
Volume 9 is part of a multicompendium Edible Medicinal and Non-Medicinal Plants, on plants with edible modified stems, roots and bulbs from Acanthaceae to Zygophyllaceae (tabular) and 32 selected species in Alismataceae, Amaryllidaceae, Apiaceae, Araceae, Araliaceae, Asparagaceae, Asteraceae, Basellaceae, Brassicaceae and Campanulaceae in detail. This work is of significant interest to medical practitioners, pharmacologists, ethnobotanists, horticulturists, food nutritionists, botanists, agriculturists, conservationists, and general public. Topics covered include: taxonomy, common/ vernacular names, origin/ distribution, agroecology, edible plant parts/uses, botany, nutritive/medicinal properties, nonedible uses and selected references.